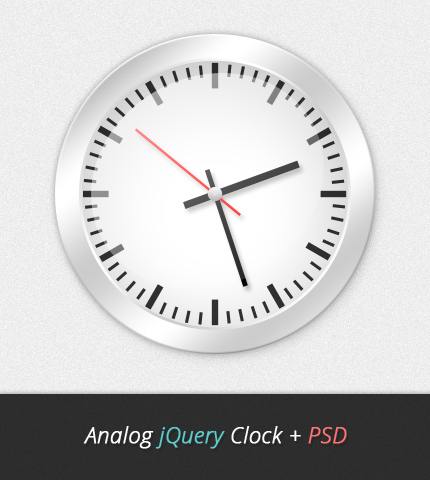 Today’s free web design resource is a glossy analog clock. I created it using jQuery and the jQueryRotate plugin following this tutorial. The clock is available in the coded version, HTML/CSS/jQuery and also in the PSD version for changing the colors and effects. You can also resize it and just use it as an analog clock icon in your projects. Let me know your thoughts and also don’t forget to follow me on Facebook and Twitter for other freebies and web design resources. Enjoy! You can use this analog clock in personal and commercial projects, but you can’t sell or redistribute it directly. If you want to publish it somewhere, please refer to this page. Your clock is nice & it’s PSD effect is like something different i like it. Thanks! Will you be using it in any of your projects?